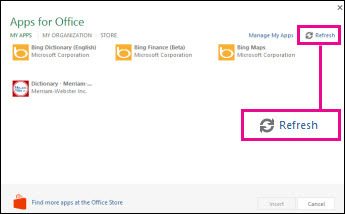 Instead of starting with a built-in dictionary, Word 2013 links you to the Office Store so you can pick a free dictionary or buy one from a collection, including dictionaries in many languages. To choose and install the dictionary you want, right-click any word and click Define. Or click Review > Define. Sign in if you’re prompted to, and look over the choices in the Dictionaries list, and then click Download to install the dictionary you want. After it downloads, the dictionary will open automatically in Word. From then on it will open whenever you click Define. 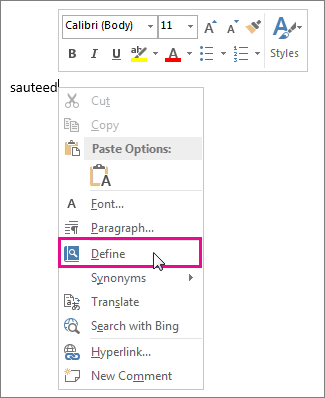 Tip: If you’re looking for a different way to say something, right-click any word in your document and click Synonyms. A short list of synonyms will automatically open. Or click Review > Thesaurus to open the built-in thesaurus. See Look up words in the thesaurus for more info about the thesaurus features. Once you’ve downloaded one dictionary, go to the Office Store if you want more. Click Insert > My Apps. 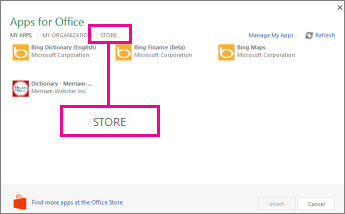 In the Apps for Office box, click Store. Pick the dictionary you want, or search for one in the search box. When you find the dictionary you want, click Add or Buy. Review the privacy information, and then click Trust it. Follow the steps in Start using an app to begin using your new dictionary. To start using a new app, such as a dictionary, find and double-click it in the apps list. Click My Apps to see your list of apps. If your new app isn’t there, click Refresh to update the list. Double-click the app to start using it.